Am I accepting of others??? Often when people talk about accepting something, they are usually referring to having to accept unwanted situations that are happening in their life, and in the lives of others. It’s true it’s virtually impossible to look in the face of something strongly unwanted and “jump for joy” about it, but we do have the ability to gradually move ourselves into a better feeling place regarding it, although many have never exercised their power to do so, and instead have focused intensely on everything in the world they feel is “bad or wrong,” therefore attracting more evidence through the powerful Law of Attraction, of that which they are not wanting. There may be circumstances and people we’re involved with that may be doing things we feel are not in our or their best interests. In these instances it’s sometimes difficult to remove ourselves from the situation, so often the best call of action is to make an effort to bring ourselves into a better feeling place regarding whatever they are or are not doing. Many may say,”I cannot do that because I strongly disagree with the choices they’re making” and although we may feel this way, people will often make their choices, with or without our input and judgements, so what is the alternative? To try and manipulate them to make the choices we feel they should be making, to stay miserable about the choices they’re making, or to move to a better feeling place about the choices they’re making? For me, there is no choice. Although this is a choice, for me it’s No real choice. What I mean is apart from just letting people be, and choosing to feel good apart from the choices they’re making, the other two choices never get you anywhere you really want to be! For example, some people may feel that manipulating or convincing others to take a different action would be a more desired outcome than letting them make their own choice, and if we’re coming from a positive place of putting a different more wanted scenario forward if someone has asked for our advice, of course, this is wonderful and may likely be considered when one was making a choice. Whereas if we’re negatively focused and judging someone as “wrong” and trying to convince them to our way of thinking, this is not that good, and they’d be well advised not to take advice coming from someone in such a resistant place. If we do manage to persuade someone to make a different choice against their better judgement, there is usually a backlash to this of negative emotions, either expressed outward towards others or inwards at the self. 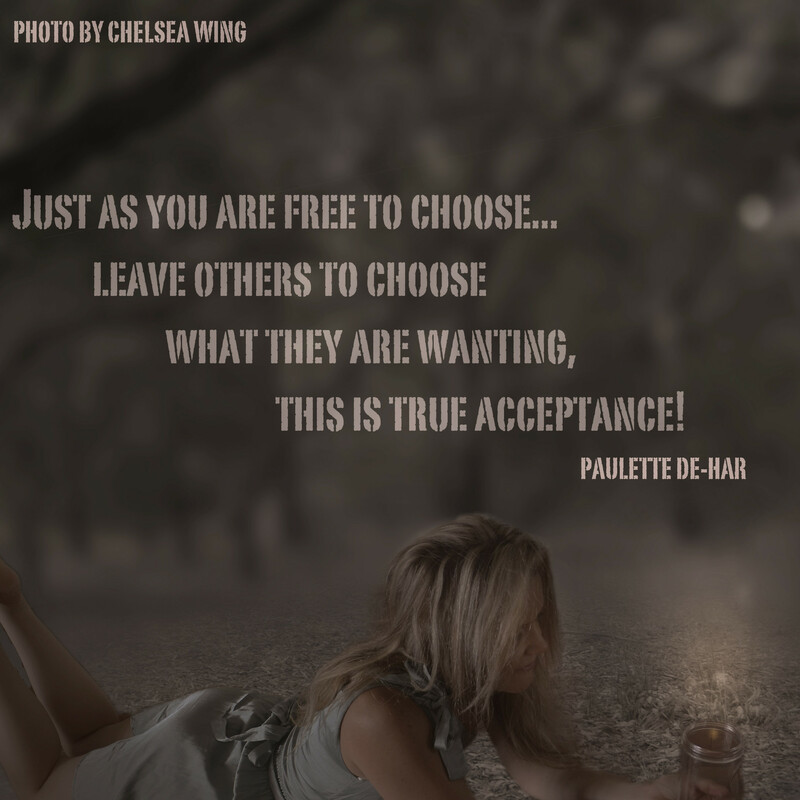 Now, just being miserable about the choices others are making is not a good option, especially when we have the ability to feel better unless of course, we are enjoying being miserable and attracting similar feeling circumstances into our experience? The easiest way I know how to move to a better place, is to acknowledge we’re all different, with different desires, and we cannot always know how a choice will unfold, for what unfolds, whether it’s positive or negative, may be exactly what is needed to move us forward in a more positive direction. Sometimes we need to make choices that send us in a direction we don’t want to be in just to know where we really do want to be! We can always move forward in a positive direction no matter what choices we make, and there’s nothing like experiencing strongly unwanted circumstances that may help us to refocus us more in the direction we’re wanting to go! Even a so-called “bad choice” can be brought to a better place by working through any resistance that comes up by doing our best to stay positive, it’s not so much about the choices we make, but how we react as unwanted, resistant circumstances turn up that determines the results we achieve. The last alternative is not to be around people who are choosing things that go against what we believe in, and for others we don’t know very well, this is easy, but with those we are close too, this is not always an option. As far as I can see, the only option is to wish them the best with whatever they are choosing and to accept that they must do what they feel is best for them, just as we are choosing what we feel is best for us…. For what else have we come into this Physical world for, if not to choose that which we are wanting?? ?